This project was inspired by the decorated steps that lead up a long hill to the neighborhood of Santa Teresa, in Rio de Janeiro, Brazil. declaring the project to be "a gift to Rio de Janeiro". the Sunset District, and the City of San Francisco. 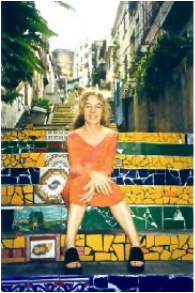 "This project started in 1990, as my homage to the Brazilian people, using the colors of the flag of Brazil: green, blue and yellow… The tiles were broken with a hammer to obtain a style known as Byzantine mosaic, mixing pieces of tile, entire tiles, pieces of mirror, crystals, and pieces of porcelain. Whenever I obtain prettier and more sophisticated tiles, I place them on the steps, exchanging them with others, so that the appearance of the steps is in constant change. The work has become a tile collection with 1,000 different pieces, open day and night to the public. It has Portuguese, Italian, French, Dutch, Belgian, Russian, German, English, Spanish, Moroccan, Egyptian, Turkish, Greek, Mexican and Brazilian tiles. … The stairway has 215 steps, 17 landings, and 16 entrances and it is four meters wide. I thank the neighbors and friends who have always helped to conserve my work, made with such sacrifice, obsession and affection. I will only finish this work on the last day of my life. When I started the stairs, twelve years ago, I started with the bathtubs. [At the foot of the steps are several bathtubs which Selarón has transformed into planters. He humorously refers to them as the “suspended gardens”]…. The thing was that I started to arrange the stairs little by little. First it was with the bathtubs, and during six years nothing happened. But I was happy because the stairs were clean and had a garden with bathtubs. I thought that this was original; I had never seen stairs with bathtubs anywhere in the world... [then came] the tiles and the possibility that they offered to keep the work open, in transformation, allowing countless changes without damaging the whole. Then I started to like it. It was emotional, because I had never made sculpture in my life. It seemed that God wanted me to make it with my own hands. I was dreaming for ten years about making sculpture... and continue... today, I am still dreaming of tiles!" Jorge Selarón was born in Valparaiso, Chile, in 1947. A self-taught painter, he left his country 30 years ago and since then has visited more than 50 countries. He lived in Europe for two years, in Mexico City for two years, in New York, a year and a half in India and seven years in Panama City. He has held over 150 expositions of his paintings throughout the Americas. He has lived in the city of Rio de Janeiro for 16 years, is married to a Brazilian and lives in the Santa Teresa neighborhood, where he has an atelier.